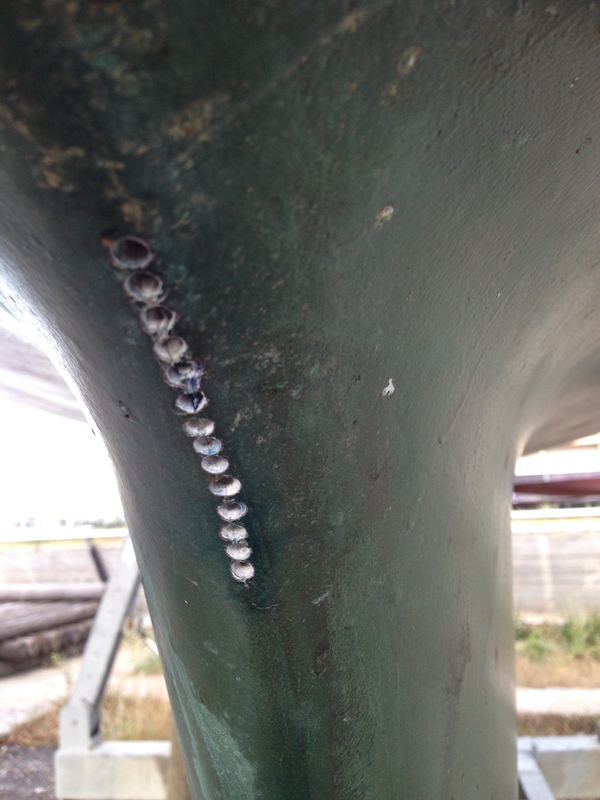 My Ballad suffered from the mast truss problem that led to the truss expanding and splitting the front of my keel open and water subsequently seeping into the bilges. 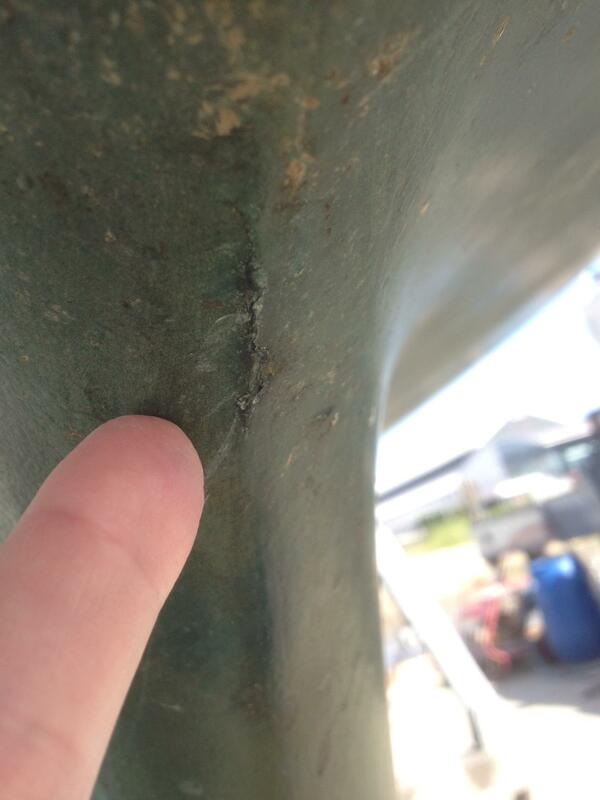 The first thing you need to do with any ‘hole’ or split in your boat is figure out exactly what caused the split and remedying that first (else any fix to the split you do will likely be short lived and it’ll just happen again). My fix for the cause of my split was removing the old truss, fixing the crack and finally replacing the truss entirely. So, how to fix that crack. Firstly, lets talk about materials. I spoke at length with the great David Johnson of Wessex Resins, who spent a great deal of time guiding me on the repair and choosing the correct materials for the job. You can source all of these from East Coast Fibreglass Supplies. 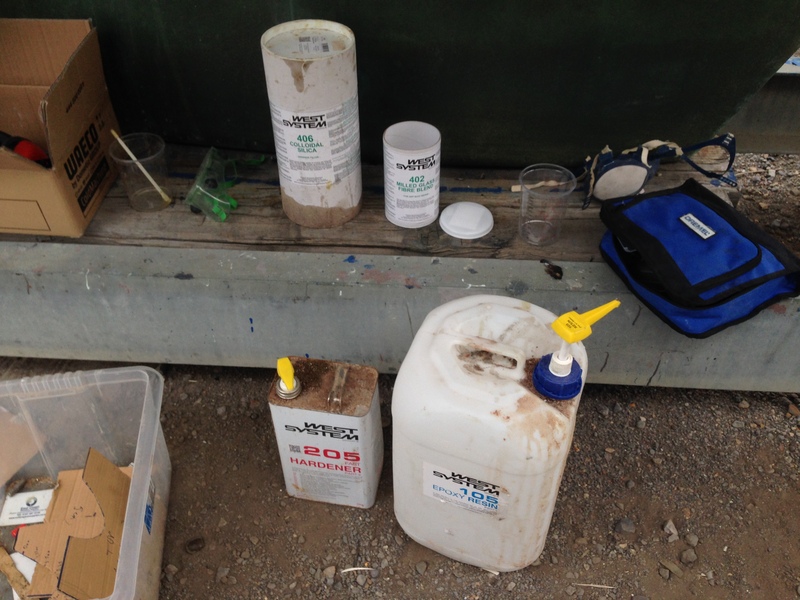 West System Epoxy, not Polyester resin. 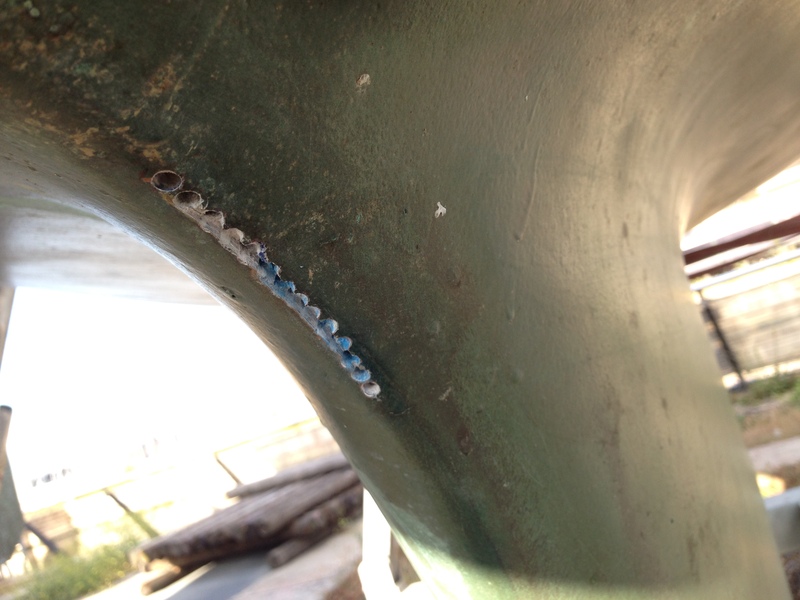 Epoxy is five times more expensive, however it is five times stronger than Polyester resin. 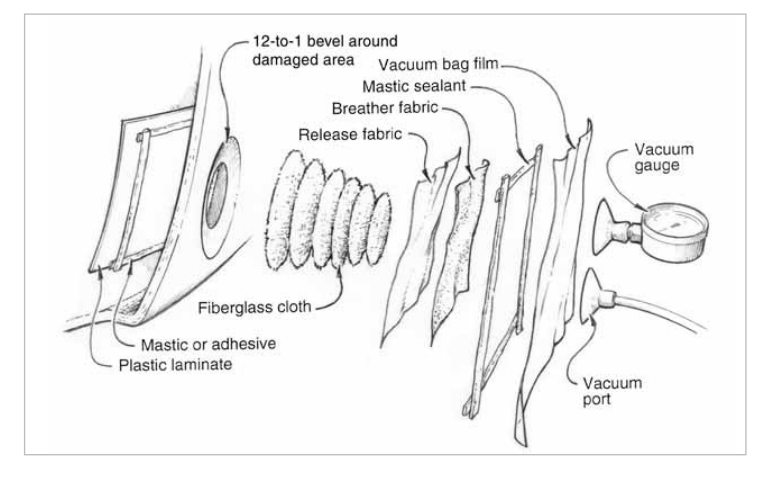 Perhaps more importantly though, is that it has far better secondary bonding characteristics (its ability to ‘stick’ to something else), so it is less likely for your repair to drop out! West System 402 Milled Glass fibre ‘choppies’. West System 406 Colloidal Silica. Peel ply – David put me on to this stuff. It is the best favour you can do for yourself. I’ll cover exactly why later. Light, 300gm biaxial cloth. 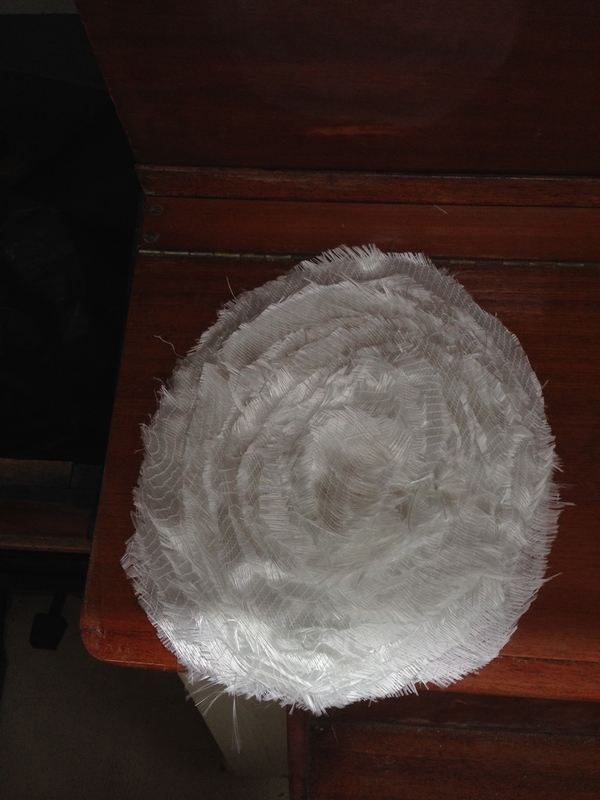 You will need more layers of it, however, it will go ‘around’ corners better and will shape to this complex area. 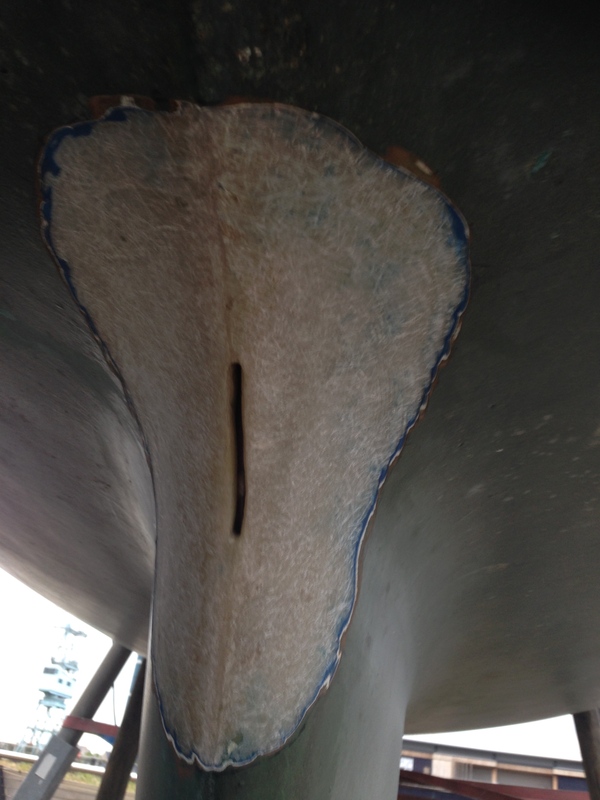 Don’t be tempted by more exotic materials like carbon fibre, glass fibre reinforced with epoxy flexes 4%, as does glass fibre reinforced with polyester (what your boat is likely made out of!). 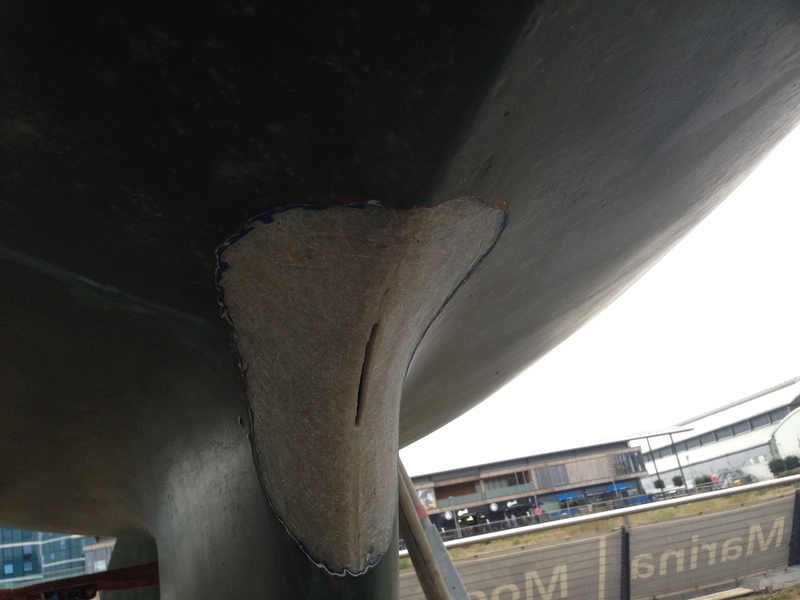 Carbon fibre and epoxy flexes only 2% and thus is not as sympathetic to your boats existing structure and stands more chance of breaking away. Cardboard for templating your ‘fix’ area. Some good quality fibreglass shears. Mixing pots, sticks and disposable paint brushes. Cobalt drill bits (HSS will certainly do). Ideally a multi tool like the Fein multitool with a diamond cutter. 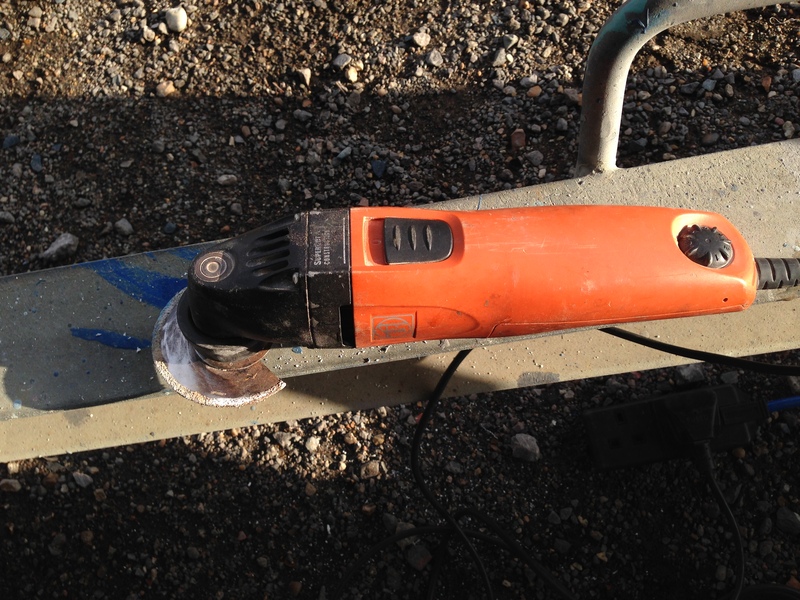 Grinder with a coarse sanding disc. PPE, loads of PPE. Disposable overalls, gloves, a good respirator, ear and eye protection. 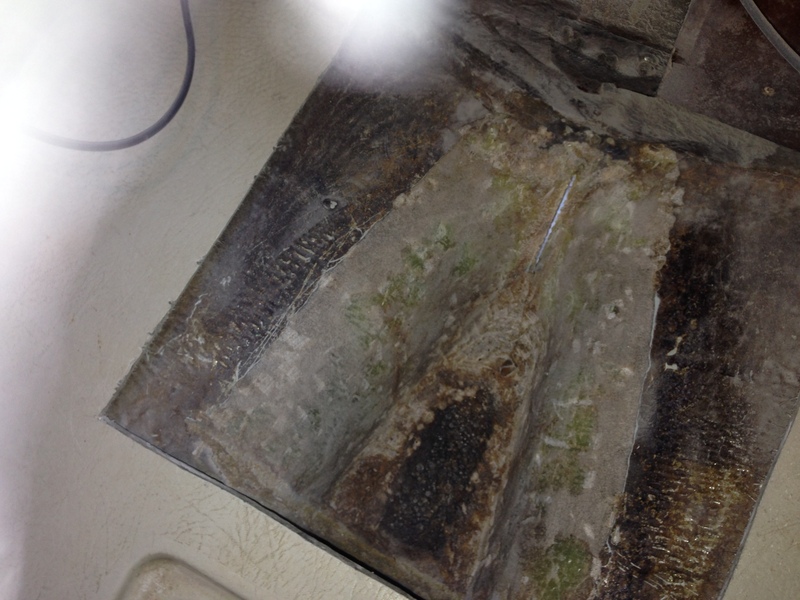 You will look like something out of Breaking Bad, however, you will be thankful to not be itching for a week after grinding away at your boat. With my repair design decided upon, I got to work fixing the crack in my beautiful Ballad. 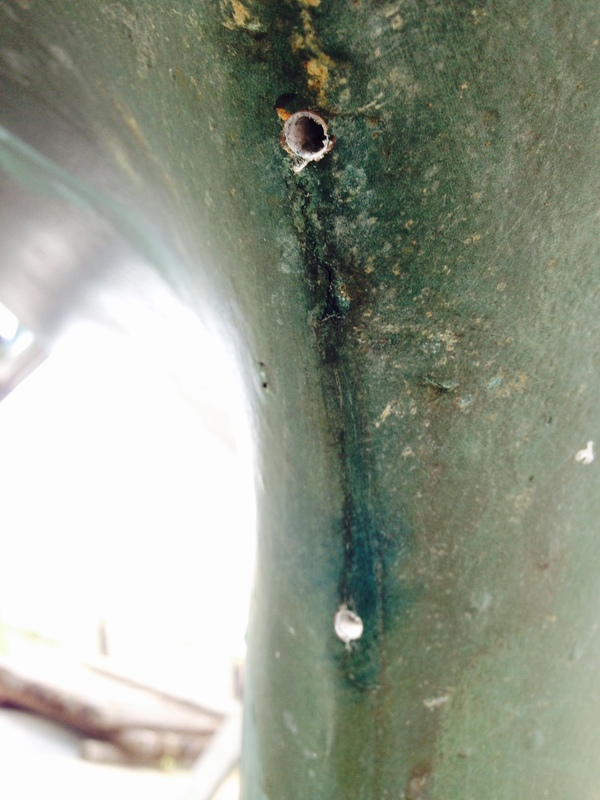 In order to repair that tiny crack, we need to drill it out. 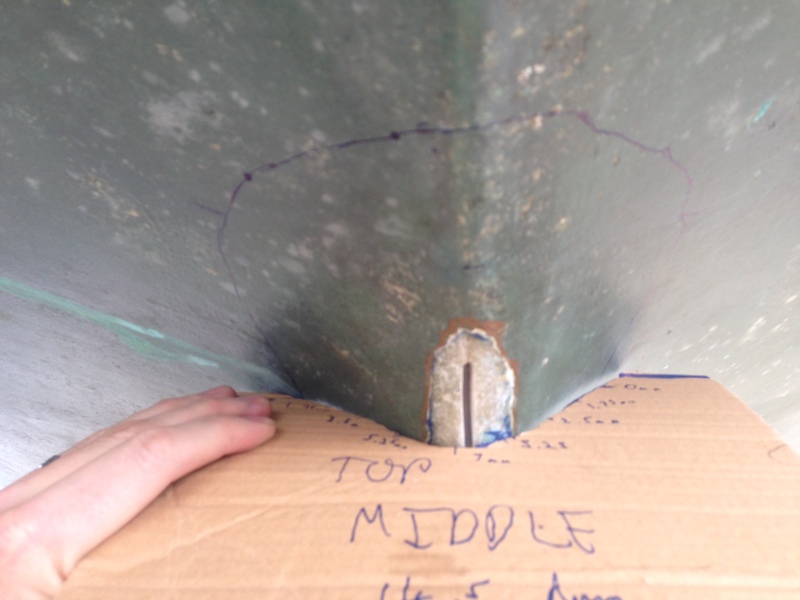 The best method, to ensure we don’t spread our crack, is to drill a hole at either end (do bear in mine that what we can see on the outside of the hull may be the ‘thin end of the wedge’ and the crack may extend further inside the boat). The important thing is ensuring you go far enough to find good, solid GRP that has not been compromised. 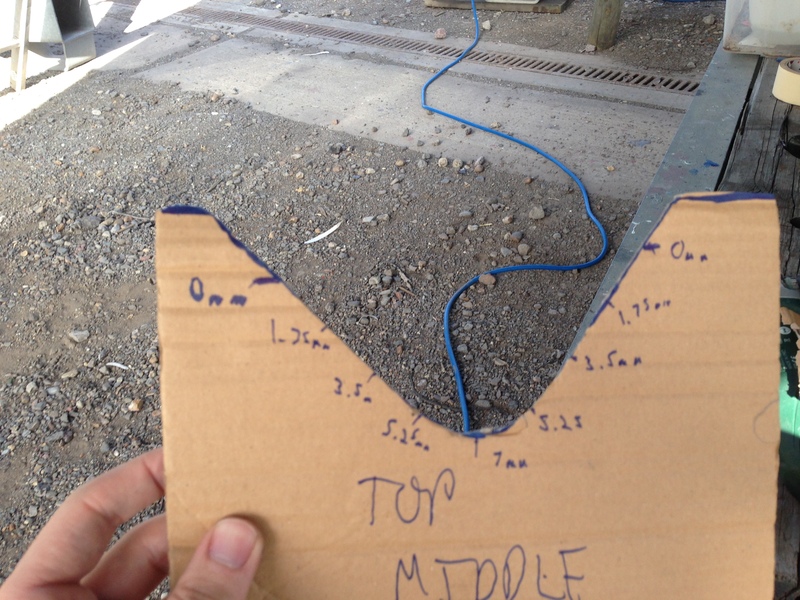 Once I had confirmed the extent of the crack, I measured out the 15:1 bevel and marked it with a marker pen. Creating a bevel on a flat surface is relatively easy to do by eye, creating a bevel in this area is pretty damn tricky! In order to ascertain how far I needed to grind back, I cut out some cardboard templates of the area and marked on it exactly how far I would need to grind back. With this done, suit up in your PPE, tape up your cuffs, get your grinder out and carefully grind back your bevel. This is an alarming job! Go slowly and carefully, checking often with your template. Once you are done, you will be left with a nice tidy hole, and a nice tidy bevel ready to be filled and glassed over. 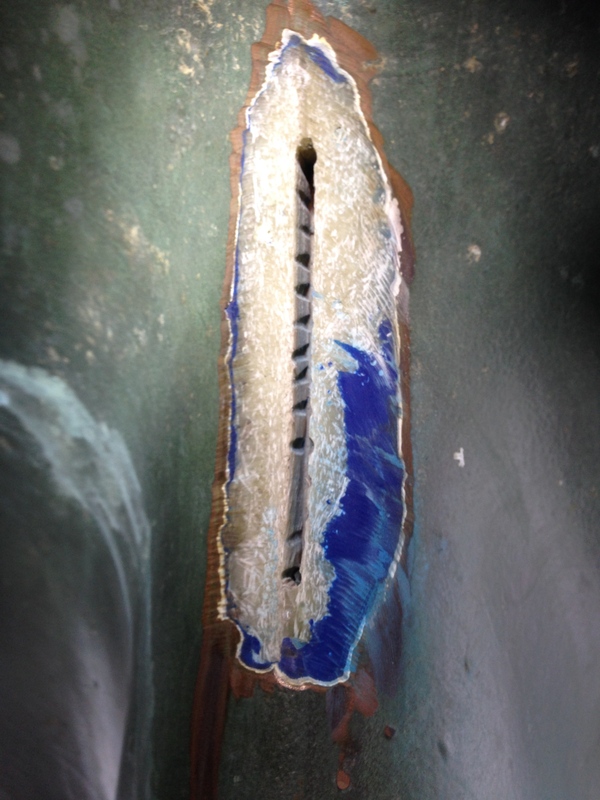 The crack was to be filled with a mixture of West System Epoxy, milled fibreglass (402 filler) to criss cross the area, and colloidal silica (406 filler) to give the mixture the thickness it needed to ‘stick’ in the hole. First clean the hole with Acetone fully, next, abrade the inside of the crack with 80 grit just to be sure there is a really good key in there for the epoxy to cling to. I put a rectangle of polyester release film on the inside of the boat, taped down and then weighed down with a couple of out of date Reeds Nautical Almanacs (their many uses!) 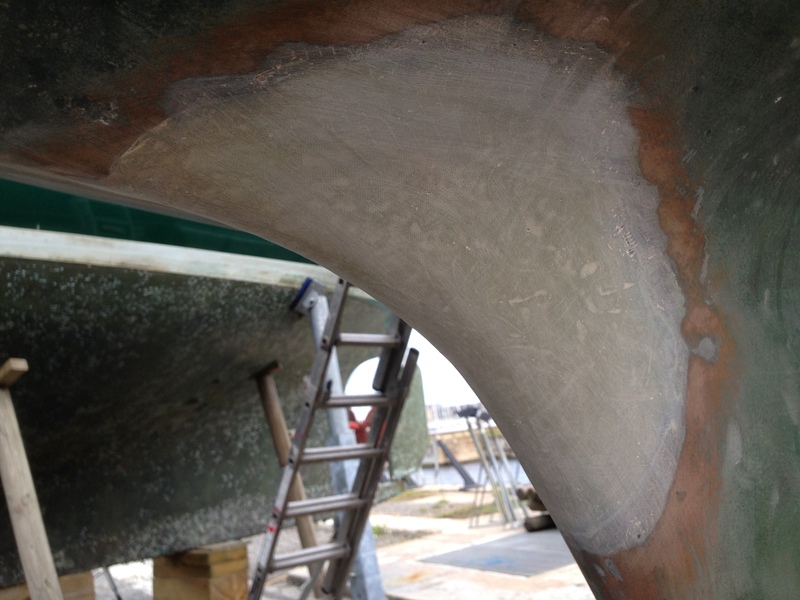 to stop the filler mixture escaping into the inside into the boat. Wet out the hole with unthickened epoxy to give the thicken mix a good base to grip to. We are now ready to mix up the filler and use a plastic spreader to work it into the crack to make sure it make contact with all sides of the crack with no voids. If I would have had my head screwed on at this point, I would have put peel ply over the top of the crack fill (something Wessex resins suggested after I had completed this stage of the process). Peel ply would have meant no amine blush (a waxy coating that needs to be washed off with water before the next stage of the process) would be produced and it would not have needed to be sanded. 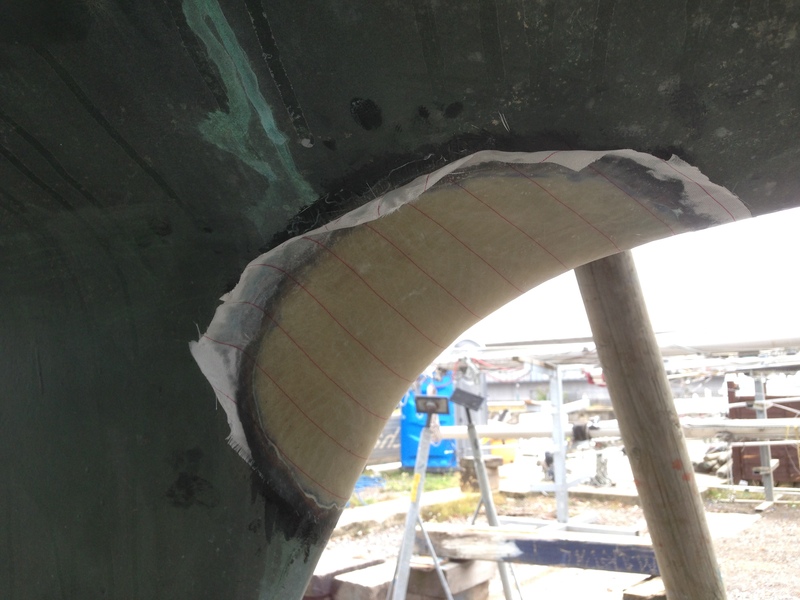 As a rule of thumb (a useful tip from the chaps at East Coast Fibreglass supplies), for every 1mm of finished thickness, you will need two layers of GRP. We need to build up 7mm, so now we need to employ some simple maths. 7mm is 14 layers of our light 300gm cloth, we need to divide that by the diameter of our bevel and cut out the cloth accordingly. 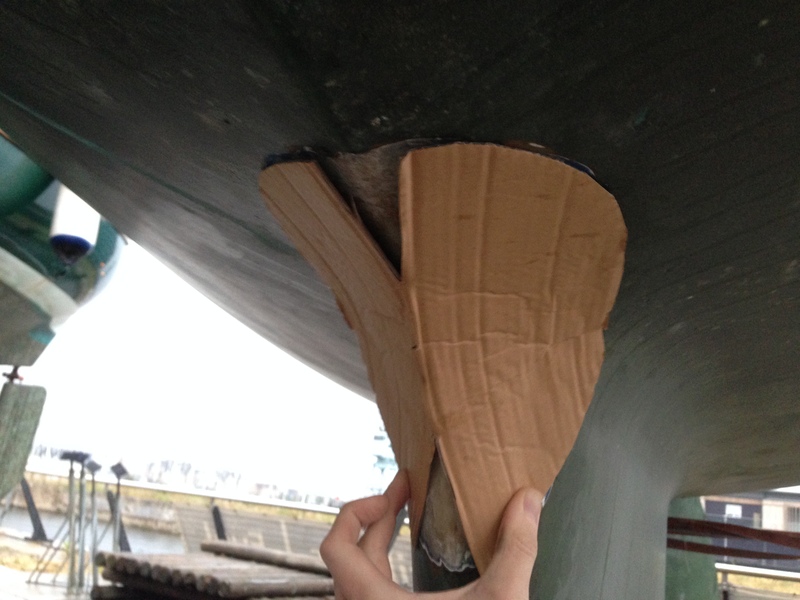 I used another cardboard template and counted on being able to stretch my cloth around the awkward three dimensional shape of the front of the keel. This is the one reason I will always get light cloth – it may require more layers, but it is more forgiving on these complex shapes. 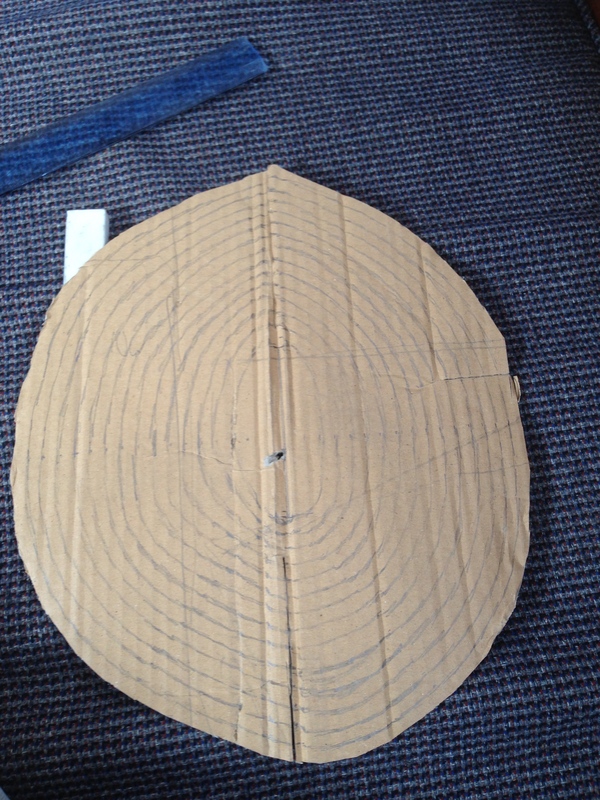 I then marked each of my 14 layers on my cardboard template, and used this to cut out my glass fibre with my shears. Finally, the whole area was washed with water and a scourer first to remove the amine blush from the previous fill (this is important, as amine blush can affect the bond of the fibreglass to the substrate), then cleaned with acetone, before giving a final rub down with 80 grit paper (note, we wash the surface first, and rub down second. This is to avoid sanding any contaminant into the GRP). We are now in a position to start glassing in our hole! First, thicken a small amount of epoxy with Colloidal Silica to use as the ‘base’ for our first layer of GRP. 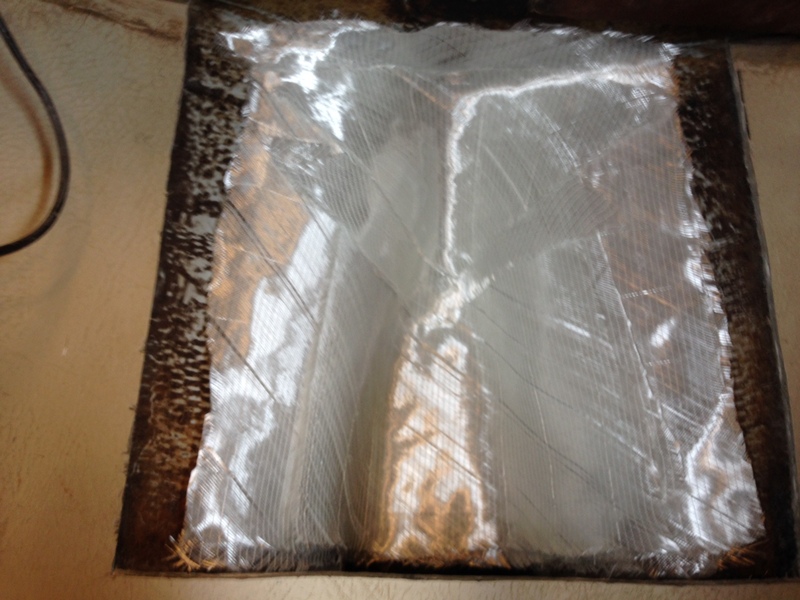 This ensures any small voids in the existing polyester is filled and gives a good base for our first layer of epoxy. Start with the LARGEST layer of glass first, as laid out in the West System documentation. Apply each layer, wetting it out fully by ‘stippling’ with the brush (do not try and ‘paint’ with the brush as you will just pull the glass fibre around), and use the consolidation roller between every other layer. Work fast and only mix up as much epoxy as you can apply within around ten minutes before it ‘gels’. 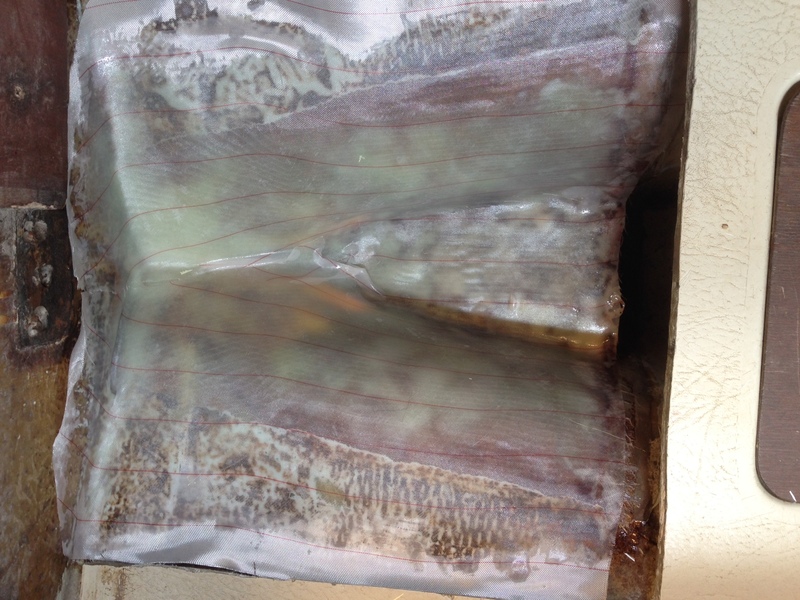 Don’t try and apply more than 14 or 15 layers of light glass in one go as epoxy is exothermic and if enough epoxy is present, it will create a chemical chain reaction where the epoxy will heat up, which will speed the curing process, which will then create more heat and so on! If your epoxy exotherms it will become very brittle indeed (not to mention it can catch fire and give off toxic fumes), so it is to be avoided. If you need to make thicker GRP, work in stages by putting peel ply on top of say, the 15th layer, let it cure overnight, remove the peel ply and continue laying up. Finally, apply the peel ply over the top – make sure the peel ply is oversized so you will have a corner to grab once the epoxy has gone off. 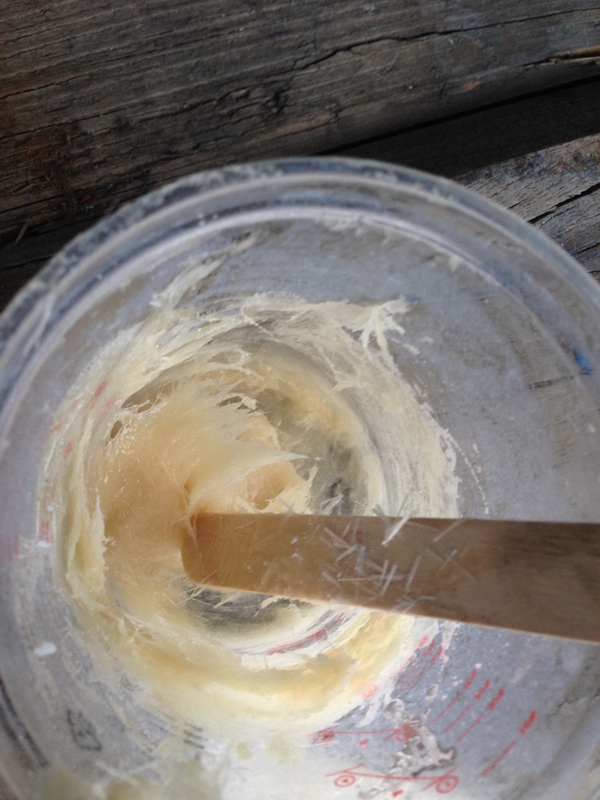 Use a spreader to squegee as much resin out as you can – the less epoxy there is in the GRP (so long as its all wetted out), the stronger your final fix will be. In reality, in a complicated area like this, you won’t want to work it too much as it is important to get the shape back. Okay, so not quite all done. I hoped I had done a good enough job that I could put my Coppercoat straight over the top of the GRP. 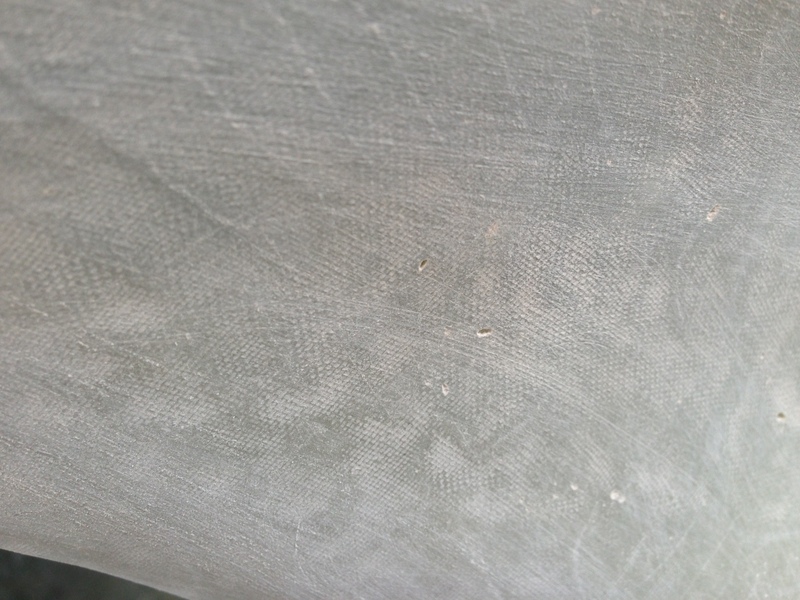 In reality, after pulling off the peel ply and sanding it down, small bubbles were apparent that would need filling. 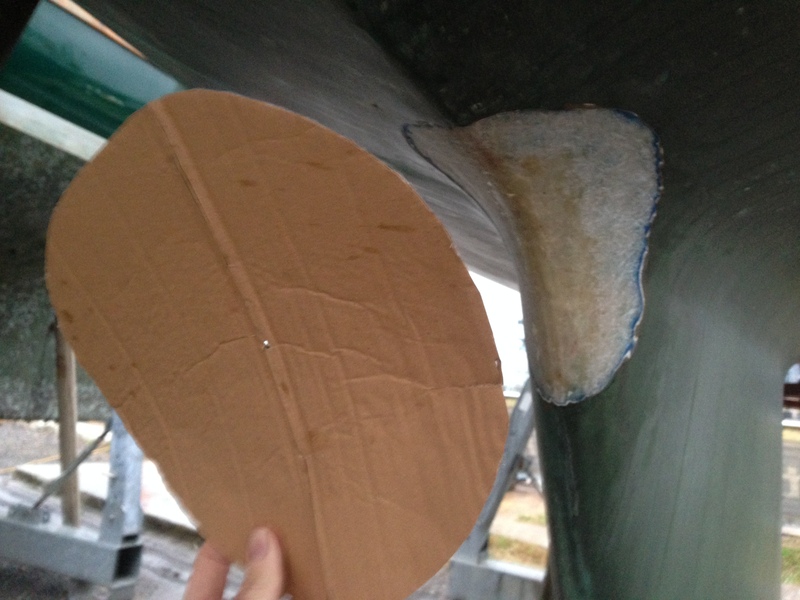 Once this was completed, I patched up the Coppercoat (you get very good at accurately measuring small batches of the stuff for this process – tip, get some good digital scales), and the keel is now stronger than it ever was. On inspecting the inside of the truss cavity, it was apparent the crack extended above and below where it was visible on the outside. Before I could glass up the inside, this had to be ground out back to good fibreglass. 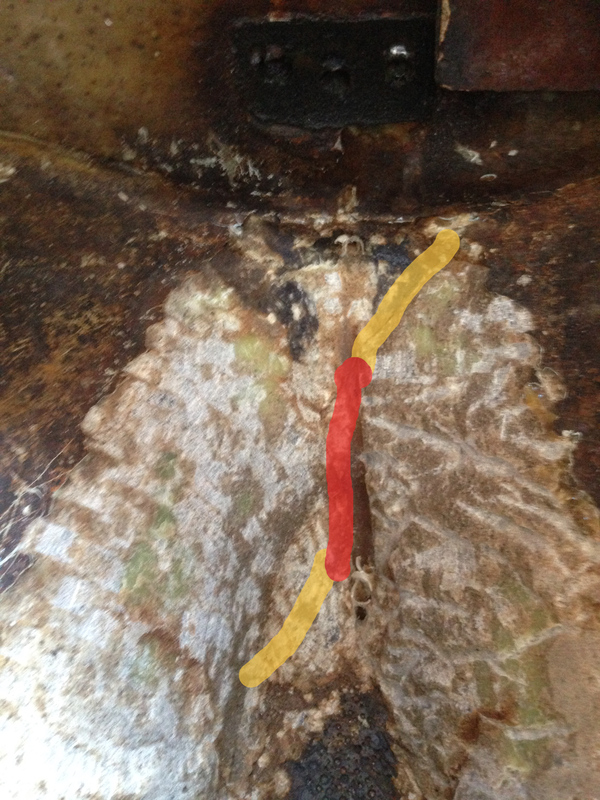 I filled the ground out sections (in yellow above) with the same mixture as I used to fill the crack in the hull of Colloidal silica, milled glass fibre and epoxy. Finally, I was ready to glass up the inside of the hull. It was even more important for me to do this as I had been chipping away at a resin block that encapsulated my mast truss leaving the whole area slightly suspect in my eyes as polyester resin is very brittle and susceptible to impact forces (a microscopic process called micro-fracturing can occur), so I painstakingly tailored eight layers of glass fibre to fit the area inside the hull. 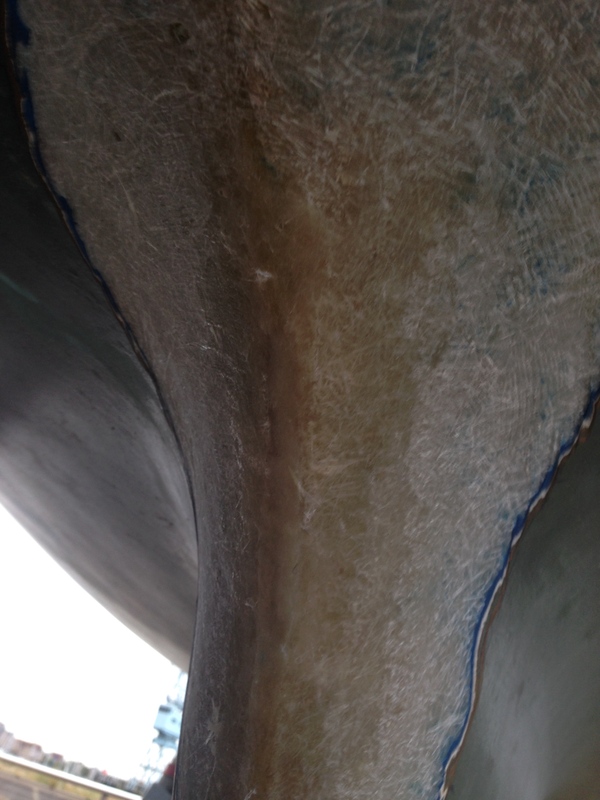 Once again, the surface was cleaned thoroughly with acetone, and was given a base of thickened epoxy to create fillets around any sharp corners and fill in any voids before the first layer of fibreglass went down. This time, I actually used 404 high density filler rather that 406 Colloidal silica as my truss would sit on top of this glass fibre eventually, so compressive strength was a priority. I finished off with peel ply once again to make the next stage of the process easier and to avoid any need to wash of amine blush, and to leave a keyed surface for the next process.